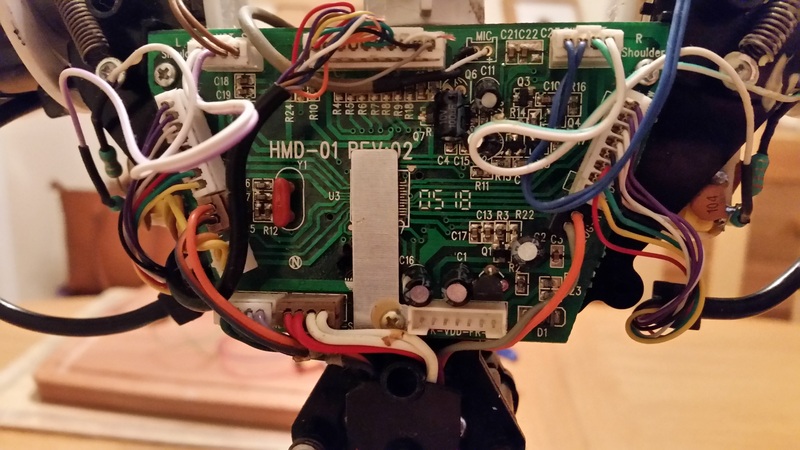 I had previously seen how to hack these by using an IR transmitter and LIRC, but this meant externally mounting the hardware and I wanted this to be a more subtle hack. Completely replace the main circuit board and control the motors and sensors directly. I opted for the first option as it is less of a hardware headache. Option 2 would require handling 7 motors with 4 h-bridges, along with a number of switches to detect maximum movement as well as “bumps” on feet and fingers, so that’s a project for another day! There are lots of resources on how to do this with an Arduino (or similar) so these were invaluable. The IR codes can be found here, a working Arduino example is here. 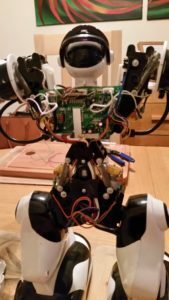 There are a few sites showing how to dissect a Robosapien but I found Markcra’s the most comprehensive. For our purposes we need to identify the IR-OUT line and a ground point, the IR receiver is located in the head but this is then fed into the control board. 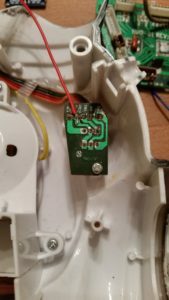 In my initial hacking I used the male end of a M-F jumper wire and pushed it into the pins on the Head wiring connector (white for IR-OUT and grey for ground). This provided a non invasive test setup so I could work out if it was feasible to do this on a Pi (hint: it is! ), but we’ll come onto that later. Having tested the principle I removed the control board and soldered on the connections needed. 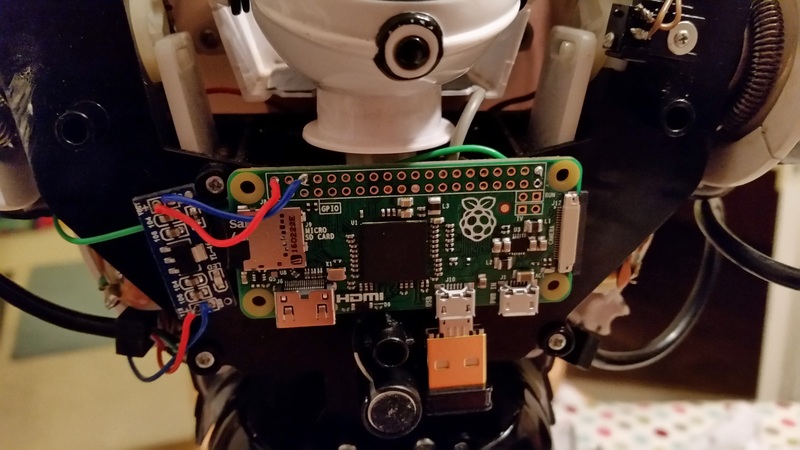 My goal was to embed the Pi, and if possible power it from the 4xD cells in the robots’ feet. These provide 6v for the motors and 3.3v for the control board and LEDs. Initially I tried to step up the 3.3v to 5v but underestimated the low power (about 100mA) the 3.3v provides. Instead I used a 6v to 5v step down (AMS1117 from eBay). 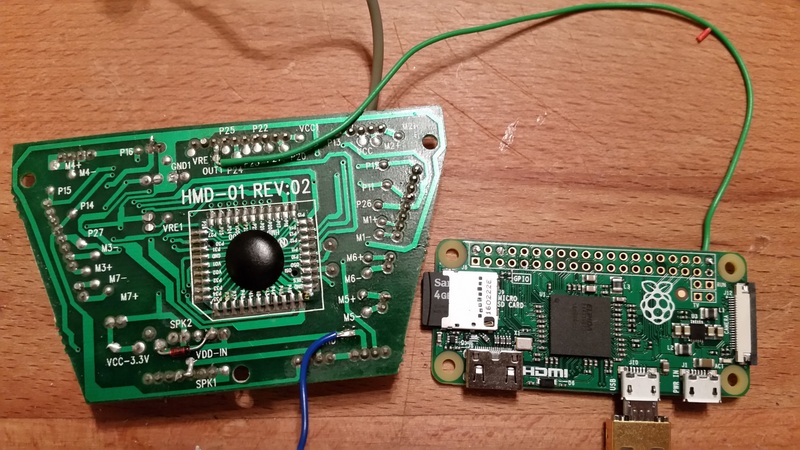 As you can see from the picture in the centre; the 5v feed is back powering the Pi via the 5v line. After a quick power and signal test I put the control board back and mounted the PiZero in the chest cavity, along with the step down power converter (above right). It is very important that the signal starts at and returns to high, otherwise the control board does not realise that the transmission has finished and will be waiting for more data. You can also see that the length of a pulse can vary from 1 to 4 cycles depending on if we’re sending a 1 bit or 0 bit value. The big problem was finding a way to generate a reliable square wave. 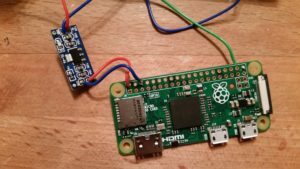 I knew it was possible as this is how Neopixels are controlled when directly connected to the Pi. The PiGPIO library has recently been added to the Raspbian repository and has functionality to generate wave forms. After some monkeying around I managed to replicate the IR signal over the GPIO wired to the control board (there may have been a happy dance, but no one saw). Once running, Python is able to interact with the GPIO via the PiGPIO service. In the supporting Python library the wave_add_generic() command is used to create the necessary square waves. This takes a list of pulse() objects, which are made up of three parameters; GPIO pin to set high, pin to set low, and for how long in microseconds. The code below shows the waves used when a bit is set to 1; wf_hi and when the bit is 0; wf_lo (as shown in the graph above). For wf_hi, the first pulse turns the pin on for 4 cycles, the second turns it off for 1 cycle. For wf_lo the first pulse is for only 1 cycle. In this configuration, 0 is used as a pin as the circuit connects to ground. We know the code is 8 bits long, and we need to know about the Most Significant Bit (MSB) first. To do this we use the & operand and do a bit wise comparison with 128, which is the value of the MSB position. Then, as the loop progresses, the <<= operator shifts the bits to the left by 1. By checking the left most bit each iteration through the loop we can now build up the wave form needed for the command. I wrapped this all up into a class and provided a function called send_code(). This allows me to pass a HEX value to function and let the class sort out the waves needed. For example, to rotate the right wrist out and in again. I have already embedded the camera module, now that the Pi Zero has camera capabilities. I just need to tidy up the interfaces and hopefully this will be my next blog post. EDIT: I’ve added some code to GitHub that checks Twitter for the #wakedino hashtag and make the Robosapien roar! I would love to see how this turns out over time. I have another similar robot I started to fiddle with some time ago from Wowwee (a RoboQuad), that I bet would be a similar hack. Can you post how you are using the camera? At the moment I’m working on a web interface with the camera stream embedded. OpenCV would be very cool though! I willing to share OpenCV code. Sorry if it seems obvious but what is the pinout for this project? Thanks in advance. There’s no specific pin out as there is only one wire used for the communication so any free GPIO will do. 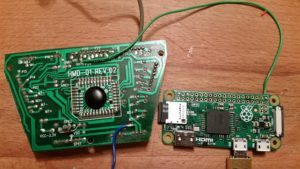 I’m using GPIO40/BCM21 in the pictures shown. The rest is just power or ground. Many thanks for posting this. We have found and old robosapien and my son and I have now got one up and running and he is connecting it up and programming it from a script.